The main problem of most smart contract platforms is not the proposed range of technical solutions and the vast range of use-case opportunities. Things that keep users from actively transferring the existing business projects to blockchain are actually quite simple: the lack of sufficient programming skills to run their own safe and efficient smart contract, high fees for executing the code and the need to create a separate IT infrastructure to integrate payments. For large businesses, all this is not really a problem – but for some reason neither Microsoft nor Amazon is in a hurry to transfer their settlements to public blockchain projects, preferring good old payments in fiat currencies over tokens, and the detailed agreements with offers developed by lawyers to our beloved smart contracts. Any attempts to attract corporations with their money, intellectual potential and connections with almost 100% guarantee are doomed to fail – the developers don’t receive anything but a bunch of nice words in the declarations. In most cases, the role of real business is formal, since the overall prospects of this market are quite vague, any significant investments are too risky, and therefore to stand aside and wait for the first success seems to be the wisest strategy. Obviously, it’s up to small and medium businesses to make a use of smart contracts, but for them, the cost of launching their own smart contract can be a decisive factor. Precium is a platform for private smart contracts based on the Onyx Chain hybrid blockchain. 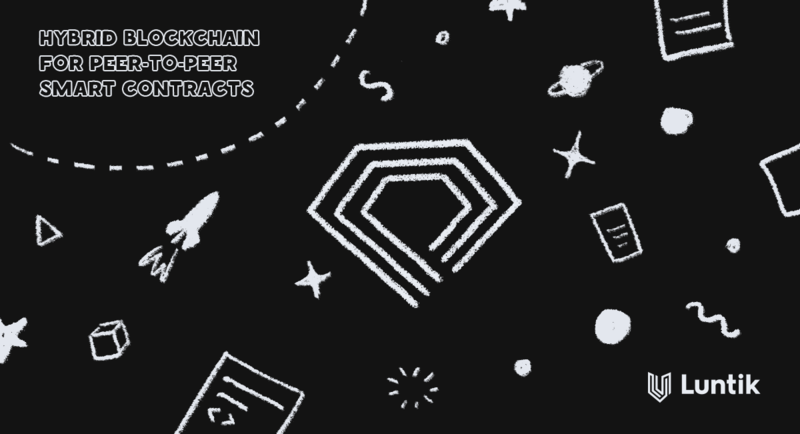 Some time ago, in the analysis of another project on our channel, we mentioned such thing as private smart contracts – they still have the full functionality of ordinary smart contracts but their conditions are partially or completely hidden from the public layer of blockchain. The Luntik’s team appreciates any attempts of blockchain projects to bridge the gap between developers and ordinary people, so the initiative of the Precium project seemed interesting to us. So far, the project is too young to make any serious conclusions, but once it is implemented, the platform could compete with market leaders by offering users a simple and convenient toolkit for creating their own apps and smart contracts for distributed networks. Why invent a new platform for smart contracts if you already have enough successful implementation? The South Korean developer team has their own view on this issue. The first thing that catches the eye is that in the Precium project, very little is developed from scratch. The main technologies, such as Go Ethereum (Ether protocol implementation in Go language) or the Raft consensus algorithm are presented using the private blockchain Quorum from J.P. Morgan, and in a compartment with Oracle API, the team presents us an interesting cocktail called Onyx Сhain. Taking the best existing technologies and building your own project oriented towards the broad masses is something the one would call an obvious move for the entrepreneur, especially if you don’t want to come up with yet another “revolutionary” product, which only developers could understand. Speaking of developers though, the team has also snatched the familiar working environment: it will be based on Solidity (the Ethereum smart contract language), which itself takes away a lot of questions regarding the further adaptation of the project. 1. Contract Creators (code “authors”) who will actually create smart contracts and receive platform tokens for their publication (with mandatory code validation in order to eliminate errors). 2. Contract Users, who will have an opportunity to use the contracts for their own needs and purposes, or even to combine several solutions with one another in order to achieve the functionality they are looking for. The process of creating a “smart contract for the lazy” is essentially filling the template with prebuilt blocks responsible for performing certain functions. However, we haven’t found any specified methods for countering the publication of many functionally identical applications in the Whitepaper, the same is true for the mechanisms of coordinating different code pieces with one another – no additional details. If here we are talking about creating a working environment for the visual development of smart contracts (similar to App Inventor for Android apps), then hats off. Such a solution would indeed be able to push blockchain-based technologies further to mass adoption. But there is always a chance for such a great endeavor to end up being another “highly detailed” API. It would obviously be a dead road for the project, that intents to involve the maximum number of users by simplifying the development process. Let's hope it’s not the case here. Another point is the “hybrid” blockchain, public for executable smart contracts and closed for the data with which smart contracts work. This separation will help protect the entire network from potential threats associated with data manipulation and improve the overall performance and stability of the platform. Precium's topology assumes that no one will ever know how many pizzas you ordered after 6 PM from a local Italian restaurant, or how many tokens you donated to the population recovery of the Nile crocodiles, or how much you were paid for your work through a smart contract. Only the hash of the processed data and the fact of the smart contract execution will get into the public blockchain, while all the confidential information will be stored in the private blockchain layer accessible only by the transaction parties. As an additional “layer” of the network, isolated from the public blockchain, the Oracle API database will be used. Oracle is a technology that imports information on the blockchain from the “off-chain” network to the on-chain network. In other words, smart contracts on the blockchain network will be able to collect information outside of it through Oracle and use this information to determine whether the contract’s conditions are fulfilled. This solution will allow increasing the productivity and scalability of the platform, as well as the processing speed and reliability of data storage, especially in cases where the amount of transmitted data is too large to be included in the standard block. Let’s suppose that according to some contract’s conditions, you have to spy on your neighbor and film everyone who comes to visit him. For these services, his wife pays you $10 per hour of observation and you have to send streaming video to a jealous spouse's cloud. Of course, gigabytes of private data do not belong in the public blockchain, but a smart contract can send a hash of a random frame and its timecode there. Why not? Now you can’t change the video and save your neighbor from having trouble at home, and his spouse can avoid payment, even though the main data was transferred directly between the participants of the transaction (through the private blockchain layer) and did not get into the main blockchain. 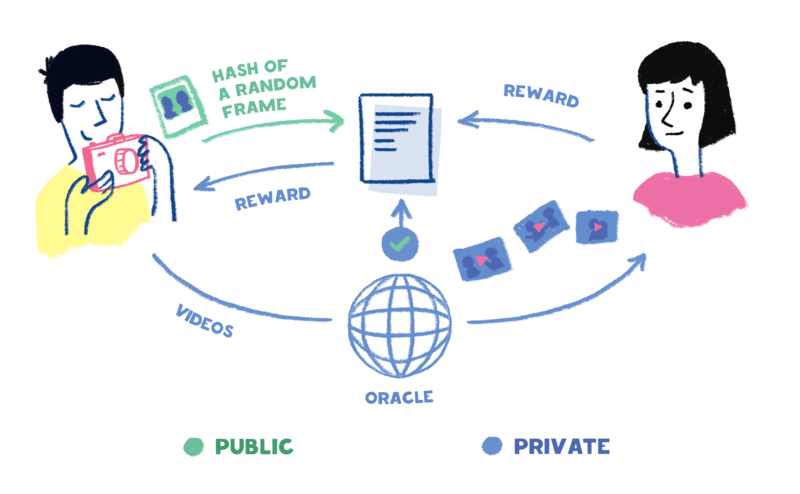 If over time, spying will become the main source of your income, and the number of your clients will increase to several hundred, you will need a database for efficient storage and processing of the received videos, and therefore an API to the Oracle database. Here is the pic to get the idea of data flow. Remember that an execution of smart contract itself is also a publicly available information, though it’s not represented on the pic. Precium's approach to developing APIs is quite unusual: it is planned to attract third-party organizations, paying for their services with platform tokens. Perhaps the problem is the lack of the necessary competencies among the team members, or maybe it’s just the focusing of efforts on other aspects of the system creation that takes place. Anyway, this is a serious barrier to an increase of solutions available for the real world business. The development will be financed through the distribution of ERC-20 Precium token (PCM) in the Ethereum network. A total of 1.5 billion tokens will be issued, of which 600,000,000 (40%) will be available at $0.035 at the Public Pre-Sale stage and at $0.04 at the main distribution stage. Another 15% of the total amount will go to developers with a lock-period of 1 year, and 5% - to advisors and partners with a circulation lock of 6 months. 15% of 1.5 billion (225 million tokens or $9 million USD) were allocated to strategic development and reserves, the same amount goes for the development of the market. As the project develops, PCM will be exchanged at the current rate for the «main» coins of the platform - Onyx coins (ONX), the cost of which will be fixed at $1. It is the ONX coin that will be used to reward the developers of contracts and the Oracle API, and to pay for system commissions as well. It will also become the main means of payment between the participants of the platform. Of course, each of Precium users will have the opportunity to issue their own token on the platform, as well as in other cryptocurrency projects supporting the execution of smart contracts. If the price of ONX does not change by the time the platform starts operating, then stability will be an undoubted advantage of Precium over its competitors. 1. Beginning of private sale – 2nd quarter of 2018. 2. The first beta version of the platform and the beginning of the pre-sale - 4th quarter of 2018. 3. The release of the first working version, and further work on the expansion of the functionality as well as integration real-world industries - 2019 (with no actual dates). Perhaps the technical details of the development are too complex, boring and incomprehensible for an ordinary investor, but we believe that the team shouldn’t have so drastically reduced the amount of available information about the main stages of the project. Future plans are on a very optimistic side here as well. Having only three very common and obvious things in the to-do list for the next whole year doesn’t seem quite right for the project with the hardcap of $19.2 mill. The fact that there is no link to developed modules in, let’s say, GitHub can serve as an additional reason for worries. Hope, we are going to get thrilled when all the necessary details pop out. There are 10 people on the team. And there are no really big names here, although if you look at the whole line-up, their education and experience in various fields - from software developer at LG to engineer of the state commission for standardization in the field of IoT indicate that there are enough competences to work well on the main details of the project. It is also interesting that in the «Specialists» (yeah, kinda weird naming) of the project there is someone named Alex Kim - the Standing Director of the National Players Association (you can’t help but recall Korean Starcraft records) and the Chairman of the Committee on Physical Education of one of the Korean Universities. With all due respect to Mr. Kim ... What is he actually doing here? He’s also a Vice Chairman of Precium Foundation. So let’s just assume that he’s doing a great job in supporting the team due to his remarkable experience. Since marketing is clearly not the project’s strength, there is no additional information on specific dates of beta release and the start of the sales. Judging mainly by Whitepaper, the main stakes in the development strategy are on cooperation (caution, article is in Korean) with the Korean-Chinese Silk Road Association through the gradual introduction of blockchain-based tools into settlements between Korea and China. Nevertheless, it is a partnership made with the Han Kim’s company, HANKY & PARTNERS (a parent company of Precium). According to the article linked above, the partnership is based primarily on consulting services in the blockchain sphere. To sum it up, the partnership, although has a strategic nature, clearly does not indicate any introduction of smart contracts based on the Precium. Okay, let's take it for granted at this stage, maybe we desire too much. Precium has a lot of professionals with experience in launching real projects in its advisor ranks - Hoontak Jung, Johnathan Lee, Joseph Jang, and others. There are also scientific experts, such as Wyeth Lee, who in addition to his position in Omni Commerce, has the experience of working in the Chinese division of Samsung. We should also mention Michael Song, who, in addition to being CEO in a number of IT companies, used to work as a business development manager at Samsung HQ in Korea. Joseph Jang also attracted our attention. Не is a COO of a very famous project called Fantom ($39.6 million ICO). Due to lack of detailed information and links to many of the project participants on the website, we decided to contact Mr. Jang ourselves asking about the project. He assured us that he indeed takes a part in the Precium project, which was quite pleasing to know. All in all, while the lack of blockchain expertise is quite obvious for the team, the full line-up might be called balanced, since professional blockchain technologies consultants (Nicko Deng) and PR experts (Daniel Kang) are also on a board. The adviser from the famous Fantom project to top it all off. Great. Partner relations, in addition to the Silk Road Association which we already mentioned, were established with the Chinese investment fund NewStyle Capital (total investment portfolio of $300 million), BitAsset, an investment and trading platform (main customers from Southeast Asia), the Chinese marketing company TwoAB, offering access to the China markets for foreign partners, as well as some other trade and investment business representatives. Despite being mainly Asia oriented, the Precium team seems to have succeeded in involving people and organizations with real opportunities to influence the future of the project. The quick search through the companies left us in a sort of confusion: there was too little information on them. So there is a double-edged sword – on the one hand, the Asian market, for obvious reasons, is extremely enclosed and not really suitable for “quick analysis”, on the other hand, this may have a bad effect on the involvement of vast amount of investors in the project. But that’s just our opinion. Precium's road to recognition will be extremely difficult - Ethereum, NEM, EOS, NEO and others already offer users completely working solutions for launching smart contracts, while Precium is yet to prove its viability in comparison to the success of distinguished leaders. Today one could already say that due to using the Raft PoS algorithm and the Ethereum Go core, the Onyx Chain network could be a quite productive and safe solution, and the Solidity development environment will undoubtedly attract already experienced developers to become Contract Creators. However, all this is necessary, yet not decisive components of success. With the current level of competition, Precium’s only chance is to present a convenient and accessible environment for an inexperienced user, in which it will be possible to create and launch your own application without using any programming skills. In addition, the “front cover” of the project leaves much to be desired, not to mention social networks and GitHub, that lack any bit of attention from the team. Don’t get us wrong, it’s cool to support the community in Telegram chat, but what about people who are willing to invest? Medium, Twitter, Youtube? While, the alternative project iOlite, which also set ambitious goals of simplifying smart contracts development, has already managed to launch a working network, Precium will have to put a lot of effort into catching up and overtaking this, even not the most popular competitor. To sum up all the above, we can draw certain conclusions. Smart contracts that can be created easily from individual ready-made elements will undoubtedly attract people from real business who in turn can get themselves a solution for distributed networks that fully meets their company’s demands keeping financial and time costs minimal. This may give an overall push to the growth of the capitalization and popularity of the project. We already mentioned the lack of social networks, GitHub, videos, articles, and other crucial sources of information. Despite the fact that they have marketing strategists, PR and even design specialists on board, the main channels of communication with potential investors are neither developed nor even presented at all. Basically, apart from Whitepaper and the very “vague” One Pager, the investor has nowhere to get information for a detailed analysis of the project, well, in fact, we did not find it either. A product distribution strategy can play a trick on its developers. Without a doubt, South Korea and China are great, but they are not the whole world. It is necessary to develop other markets, including America and Europe, fame, and recognition in which are the most important components of success. Just take a glance at the main competitors and you’ll see it. At least, the start of a public ICO and the release of a beta version of the network. The 4th quarter of 2018 is here, but the developers are still silent and are not trying to attract additional public attention to their project, which somewhat indicates an increasing likelihood of postponing the release to a later date. $19.2 million for the project, where most of the technologies are either to be developed or have already been built by third-parties developers and not by the team, is not a very attractive number, especially, in the current market conditions. At this stage, we do not undertake to predict the price dynamics of the Precium tokens, since the approximate starting date of the pre-sale or the release date of the working version are TBA. It's better to wait for the first integrations with real business, more active and vastly presented social networks as well as a more detailed roadmap of the project. In the meantime, the fact that there are no real-world partners, detailed information and a confirmed team line-up is rather confusing since the project is not on such early stage of its development (at least according to the roadmap on the website). If you want to receive latest blockchain analytics, you are more than welcome to sign up for Luntik ICO Reports Telegram channel! We help you to invest wisely. Cryptocurrency and ICO investments are highly risky. You’re not becoming a shareholder by buying project tokens. Profits are not guaranteed. Views shared in the review are subjective. Invest wisely.